Erica Andrews and her partner, Matt Hogan, shared a vision when they first visited a property on Costa Rica’s Pacific coast in 2006. At that time the property was being marketed as a timber harvest site. But they felt compelled to find a better use for the enchanting land. 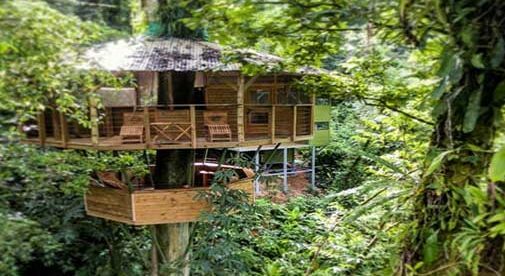 Their dream was to create an off-the-grid treetop paradise for those searching for a life less ordinary. And after a decade of hard work and determination, their vision has come to life. Their eco-community is called Finca Bellavista, and includes almost 600 acres of primary and secondary growth forest and recovering pastureland. It includes an entire peninsula of rainforest, mountain whitewater river frontage, and plenty of wildlife. “The land is subdivided into residential parcels that we sell. We then help the owners design and build their dream treehouses. We have a property management company that cleans, maintains, markets, and makes reservations for their properties when they are absent,” she says. The business is a culmination of Erica and Matt’s shared interest in the environment and sustainable living. Erica spent many of her childhood years on her grandfather’s ranch in Oklahoma, where her appreciation for the natural world was born. After high school she attended Western State Colorado University, where she met Matt in an ecosystems management class. At that time, he owned a distribution company for roofing supplies made from recycled materials. “The classes were outdoors, encouraged independence and creativity, and common sense in projects and problem solving,” says Erica. It was this experience that gave them the know-how to open Finca Bellavista. Back in 2006 neither Erica nor Matt had the financial means to purchase land. But after walking the river frontage where their eco-community now sits, and feeling drawn to the property more and more. They became very concerned that someone would buy it and cut down the spectacular trees, so decided to find a solution. “We now have 13 rentals that we manage for absentee owners. We function as a sort of treehouse resort community. Each house is individually owned. We wanted to create a rainforest immersion experience like nowhere else on earth, and that is what we have done,” says Erica. Acres of organic gardens, zip line tours, miles of hiking trails, rivers, and waterfalls complete the amenities in this wildlife-filled tropical paradise. The Finca Bellavista base camp provides customized activities, tours, bike trips, yoga classes, and movie nights. There is also a community dining hall and a WiFi zone—a cozy environment where visitors can gather for happy hour and relax. The grounds are tranquil and include stunning arrays of vivid blossoms and row upon row of fruits and vegetables. A system of scenic hiking trails showcases the natural features of this community. And provides a unique way to explore the flora and fauna of this breathtakingly beautiful country. Due to the enthusiastic interest in their project, it was not necessary for Matt and Erica to incur loans or a mortgage, although it took hard work and patience to see their project come together. They now grow gradually, as feasibility and finances allow. They add a unit or two each year and try to maintain steady growth in order to hire more people, improve the infrastructure, and make operational improvements.